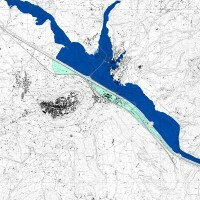 The Tiber River Basin Authority (ABT) and the Umbria Region (Service Water Resources and Hydraulic Risk), considering the verified underestimation of the flood-prone areas in the Paglia River basin provided by the Italian PAI (hydro-geological management plan) and the update of rating curves, decided to revise the hydrological study of the drainage basin in order to re-estimate the flood hazard maps for the Paglia River reach bounded upstream by the hydrometric site of Allerona and downstream by the confluence with the Tiber River. Flood hazard maps estimation for the Paglia River reach bounded upstream by Allerona hydrometric and downstream by the confluence with the Tiber River. Geographic Information System: collection of all available information on geo-morphological properties of the basin, hydro-meteorological data time series, geometric and hydraulic characteristics of the main channel and the floodplains, historical flood events. Hydrological analysis: addressed to evaluate the maximum flow discharge and the corresponding volumes in river sections of interest and for flood events with return period equal to 50, 100, 200 and 500 years. To estimate the design hydrograph, we used both the empirical approaches and a procedure based on a conceptual semi-distributed rainfall-runoff model implemented and tested for several basins of Upper-Middle Tiber with sizes ranging from few tens km2 up to several hundred km2. Hydraulic Analysis: addressed to evaluate the flood routing process in the selected river reach and the areas affected by flooding. The study has been carried out through one-dimensional non-stationary hydraulic modelling. Flood hazard maps for return period equal to 50, 100, 200 and 500 years.